Alfa Romeo is entering completely new territory with the introduction of the 4C and as well as introducing a host of technologies that are new to the brand it also gives it a car to rival other traditionally sporting brands. Limited production means it will not be around for long but the 4C is the most radical car to come from Alfa in decades. Although the iconic Italian manufacturer has a glorious back catalogue of sporting cars all its offerings in recent years have been based upon standard models ñ bar the very limited production 8C. The 4C however marks a radical departure for the brand as it attempts to reassert its performance credentials with its new sports car. Compact in length at under four metres the 4C is a strict two-seater with only the bare minimum of concessions to driver comfort. Rather than conventional materials the 4C is constructed from carbon fibre, making it very light and very stiff which help to boost its performance. Body panels are also produced in a composite material for further weight saving. The 4C comes with a single engine and gearbox option – a 1750cc turbocharged unit mid-mounted and driving the rear wheels through the latest version of Alfa's dual-clutch transmission. The engine itself has an aluminium block making it significantly lighter than the similar engine used elsewhere in the Alfa range. 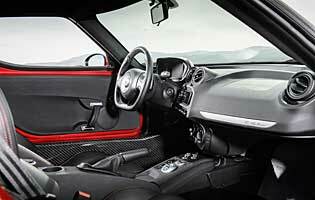 Inside the 4C is designed to be a focussed driving machine. The cabin itself has no conventional carpet and lots of exposed structural materials, while the instrument display is fully electronic and customisable by the driver. There is no power steering and the seats have been designed to allow feedback from the car back to the driver. 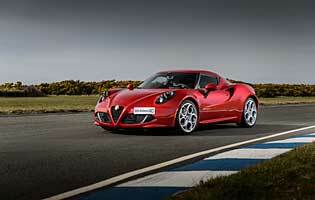 The 4C is so unlike any other Alfa Romeo on sale today it is likely to appeal to a completely different kind of buyer. It is a highly-focussed and uncompromising sports car that offers impressive performance and highly involving handling, but it does so with few concessions to driver comfort or usability. As an everyday car it is unlikely to appeal, but as a weekend toy and a car for special occasions it is terrific fun. The 4C has a sizeable purchase price, even allowing for its exotic construction. Although also capable of quite impressive fuel consumption thanks to its light weight, it is unlikely to be driven in the required manner to achieve such figures. The 4C's performance-oriented approach means practicality takes a back seat. The boot is small and the space in the cabin is limited both for passengers and oddments. Occupants of average height will manage but taller adults will struggle to find comfort. The layout of the 4C is easy to get to grips with, putting a customisable display right in front of the driver and grouping the remaining controls on the centre console. The display itself can be altered to display the pertinent information depending on the driver's needs, while the simple layout of the console makes it easy to find the required button without great effort. Comfort is a low priority for the 4C, and anyone looking for a comfortable sports car should consider something else. The seats are supportive in terms of keeping you in place during cornering but offer relatively limited adjustment and are less suited to taller drivers. Noise levels are high, the ride is firm and it is not a relaxing car to drive. The standard security system on the 4C is an alarm and immobiliser, and there are no further options available. A tracking system is highly recommended for a car of this nature. The fact that the 4C is built from carbon fibre means it will have a very strong structure, while the performance, grip, handling and breaking power give a high level of active safety. In addition the electronic aids include ESP, which can be partially or completely switched off. Above all else the 4C is a car for the purpose of driving enjoyment. 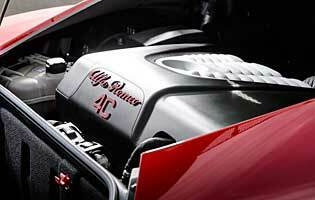 The DNA switch on all Alfa's is present here but has an additional race setting for maximum driver control. It can be driven in automatic mode with modest effort but only when driven with vigour does it deliver. The turbocharged engine is responsive and vocal, the steering is heavy but full of feel and the suspension delivers tight body control. It is a car for the right occasion and for drivers who want undiluted thrills. As much as enthusiastic children may love the thought of travelling in the 4C, the fact that it is a strict two-seater and has a small boot means it is only suitable for families of two. Not only is the 4C likely to be too expensive for anyone new to driving it is also not a car for the inexperienced: difficult to park, limited visibility and heavy steering mean it should be off the shopping list. Alfa Romeo's quality issues appear to be long in the past and despite its specialised nature the 4C has a good quality feel, although its highly-strung nature may make it feel a little unrefined. Even though Alfa Romeo has a sporty image the 4C transcends this with its focussed, low-volume appeal and stunning appearance. 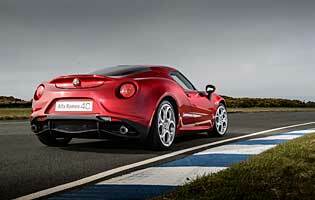 The Alfa 4C is not a car that will suit all shapes. The small doors open to reveal a large, high sill that needs to be negotiated, and the whole car is set very low to the ground. Access to the boot is through a conventional lid but the aperture itself is slim. The 4C has a compact touchscreen display in the centre console with Bluetooth connectivity and a radio tuner, which should be enough to satisfy most buyers of cars like this. The 4C's sensuous curves have been seen in few colours other than the traditional Alfa red launch colour, but it's hard to see it looking unattractive in any shade. As for the inside it is mostly black with flashes of carbon fibre, aluminium and body colour too. Visibility out of the 4C is relatively marginal. The windscreen offers a good view but the nose dips out of sight quickly, while to the rear there is only a slim window over the rear deck. Rear parking sensors are also an option and with no power steering the 4C is far from easy to park. Tyre repair kit as standard, space saver a cost option. Petrol engine options: 1.75-litre (240bhp). Transmission options: Six-speed dual clutch transmission as standard. No trim levels, only Racing and Luxury trim packs.